On your second visit, you will receive a complete detailed report of our findings. We encourage concerned spouses to attend for this important discussion. Upon arriving, you and your spouse will be escorted into our Report of Findings room where your x-rays will be on display. You will watch a brief second day video discussing key points of your visit and normal findings on x-rays. This video shows pictures of normal x-rays and the importance of ensuring that your spine is as close to normal as possible. 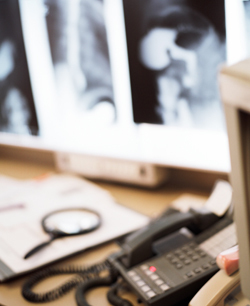 The time with the doctor gives you an opportunity to discuss and compare with your x-rays in private. Four key concerns or questions are answered. Any home recommendations are discussed in addition to any questions. Once completed, we proceed forward with care and you will receive your first chiropractic adjustment! The 1st and 2nd visits are the longest visits that you will have in office, from now on your visits will only consist of an adjustment or re-scan on re-examination days (every 12 visits). Click here to learn what you can expect at your regular visits to Family Wellness Chiropractic.